The HP Pavilion 570-033w has a complete set of features that set it apart as a no-frills casual use desktop. With an impressive-on-paper specs list, this improved PC is a winning machine for users without the knowledge of building their own PCs. 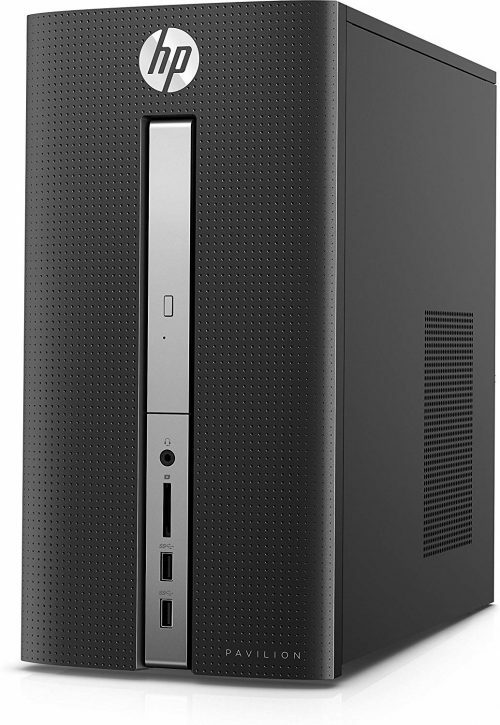 If you have no experience of assembly, or just plain and simple prefer a prebuilt system, the HP Pavilion 570-033w desktop is a great choice. Among its most defining features are a 7th Gen processor, futuristic USB Type-C port, plenty of memory and overall great price. Together these components work to make this PC a prized possession for plug and play and handling general home/office tasks. Find out why we vouch for it. While many DIY-ers might want to build their own PC, others just want a plug and play machine. The HP Pavilion 570-033w provides impressive power that the many shoppers looking for in a productivity PC. One of the best things about it is the palatable price point and value for money performance it offers. Even without a dedicated graphics card, the HP Pavilion 570-033w brings in all the muscle and proficiency needed to handle general home and office productivity. It receives our Editor’s Choice for best budget general productivity desktop. The HP Pavilion 570-033w desktop does not scream gaming or tout an out-of-the-world gaming theme. No, it doesn’t sport an eye-catching theme but you’ll easily fall in love with it if you’re as simple to heart as it is subtle. But what it lacks in looks it makes up for in sheer muscle and computing comfort particularly because it’s geared towards productivity. The design is simple and it takes on a space saving model. What we loved most about the case is that is sturdy and firm. There is a plastic case that enshrouds a metal framework at the front. It has a smooth feel and dotted design about it and also feels very durable. Overall, the design is unassuming and does its purpose. Measuring at 12.4 x 6.42 x 12.09 inches (12.57 pounds), the HP Pavilion 570-033w stacks itself in the realm of other space-saving home/office desktops. The favorite Acer Aspire TC-885-ACCFLi5 Desktop measures 13.78 x 6.42 x 13.39 inches making it slightly larger than our unit. Both share a category but the Acer Aspire strives ahead because of a more up to date Intel Core i5-8400 (8th Gen) processor, 12GB and 2TB storage. Our unit shares a similar look and design with its sister HP Pavilion 570-p030 desktop we reviewed earlier. Planning on getting to the hood, fine. You won’t have to struggle to get there. While the case is not made tool-less, the few screws at the rear of this PC won’t provide that much problem to open. With a screwdriver, it’s a pretty easy task gaining access to the computer’s internals. The inside isn’t crammed but the PC is overall fairly small to contain a GPU should you need to upgrade. A 160mm card might fit. However, for other larger GPUs, you would have to get rid of the optical drive eating into the space available. Also, if you’re planning on that upgrade, it would also be recommendable to upgrade the 180W power supply unit available. Every productivity PC needs a healthy set of ports both at the front and rear. The HP Pavilion 570-033w takes that to heart with a couple of ports on either side. Most notable is the futuristic USB Type-C port which ensures this PC stays up to date (remains relevant) over the next 5 years. Other ports include 3 x USB 3.0 (1 front, 2 rear), 2 x USB 2.0 (2 rear), 1 x HDMI, 1 x VGA, 1x LAN (Gigabit Ethernet), 1 x Headphone/ Microphone (front), 1 x audio line out (rear). Thanks to the VGA and HDMI port, the HP Pavilion can support two external monitors. An extra graphics card can offer you the advantage of a third monitor if you wish to have a triple monitor set up. As far as wireless connectivity options go, there is an 802.11bgn Wi-Fi set up built in. HP includes a manual packaged in with everything else. It comes in handy when you need to connect things together. Also, HP offers a 1-year warranty with this purchase. Processor aside, the HP Pavilion 570-033w packs 16GB memory which for the most part is more than enough. 16GB is more than what you get on the HP Pavilion 570-p030 desktop (12GB) meaning our unit takes the upper hand here. Why is memory important you ask? Well, like previously mentioned 16GB is more than enough for run-to-the-mill tasks such as home and office productivity, web browsing, media streaming, photo editing, and gaming. That means you can work on office documents, handle heavy multitasking while running multiple of tabs simultaneously on your browser. If you want to game, this memory size will still be enough to work with the graphics card you opt for. A Nvidia GeForce GTX 1060 GPU is what we recommend if you’re thinking of venturing into gaming territory. That also means upgrading the power supply unit as 180w is hardly enough to power the GPU and other components together. HP managed to push in a mean dose of hard disk drive storage here. With the promise of 2TB mechanical drive, data hogs get plenty of storage to cover their data, movie, pictures, digital content, operating system, and program collection. Speaking of the operating system, this PC ships with a Windows 10 home 64 bit OS. The OS is loaded on the hard drive where it has plenty of room to function. Because the HDD has a 7200RPM spindle speed, fetching data is obviously relatively faster compared to 5400RPM, which is great. If you prefer faster performance on storage (this is for speed hogs), it goes without saying that a solid state drive is the way to go. Upgrading to a 128GB, 256GB or 512GB solid-state drive is sure to improve overall booting up and loading of software. If you’re a professional editor or your work requires programs, an SSD would be a safer and faster option. Expect to spend some money here too because SSDs are a little bit pricier than HDDs. If you’re thinking of gaming on this PC, your hopes might be dashed especially if you’re particularly looking at handling AAA titles. While the Intel i7-7700 processor is a great processor, its low-power version and the fact that it’s not overclockable disqualifies it from handling really graphics intensive games. The lack of an unlocked multiplier and a dedicated graphics card takes off the most recent gaming titles out of the question but leaves the more dated games in place. Working hand in hand with the memory, the HP Pavilion 570 can maneuver its way around such games but on lower settings. Thanks to the Kaby Lake processor, the whole HP Pavilion 570-033w has seen remarkable improvements in speed and performance compared to most HP home office PCs we’ve seen. Our reviewed unit shines most especially in multi-core-dependent tasks. For instance, media projects and running programs and apps. Bottom line, the HP Pavilion 570-033w is a beautifully designed PC that hits the spot of power, price and home/office performance with little compromises. While it doesn’t offer impressive gameplay on Full HD (1080p settings) or VR it can handle some older titles decently. Also, although the interior might need a bit of tidying up, the plenty of storage, memory, and ports only sweeten the deal. 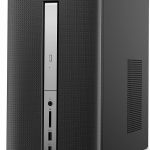 If you have a little extra money on you, the HP Pavilion 570-033w desktop is a significantly great option to consider(is cheaper). Alternatively, we also recommend the Acer Aspire TC-885-ACCFLi5 Desktop which costs way less but comes with an advanced i5-8400 processor and 12GB memory. Previous Article How Thin Should a Laptop Be?